Goodreads Summary: Senior year is over, and Lucy has the perfect way to celebrate: tonight, she's going to find Shadow, the mysterious graffiti artist whose work appears all over the city. He's out there somewhere—spraying color, spraying birds and blue sky on the night—and Lucy knows a guy who paints like Shadow is someone she could fall for. Really fall for. Instead, Lucy's stuck at a party with Ed, the guy she's managed to avoid since the most awkward date of her life. But when Ed tells her he knows where to find Shadow, they're suddenly on an all-night search around the city. And what Lucy can't see is the one thing that's right before her eyes. This book had me intrigued before I even opened the pages. From the great cover to the synopsis, Graffiti Moon seemed like it could be a very sweet book with a great love story. Unfortunately, it didn't live up to my expectations. Let me begin by saying that I think I am in the minority when it comes to reactions to this book. Even though it had it's good points, I had more issues with it than I was expecting. It took me a while to get into this book. What I considered to be a major plot point was revealed fairly early (read: in the first ten pages), and that threw me off a bit. Beyond that, though, not much happened in the first third of the book. However, during the setup, a lot of the dialogue was hard to follow, forcing me to reread passages several times to determine who was saying what. And although I did like Ed and could sympathize with him, I found it difficult to connect with the other characters. What kept me reading this book (because I did consider putting it down) was Crowley's writing style. She used some beautiful imagery, and I enjoyed seeing how Shadow's graffiti translated into Poet's words and then into Lucy's interpretation. I also liked the extra poems that were interspersed with the chapters of Ed and Lucy's point of view. Yet even though I did finish the book and liked the ending, I never felt the connection to the story that I was hoping for. As I said before, I am in the minority with my feelings about this book. 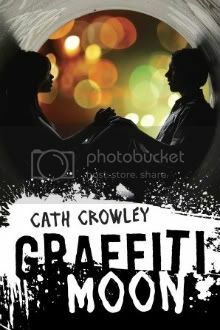 Though Graffiti Moon didn't meet my expectations, I wouldn't discount reading something by Cath Crowley in the future for her writing style alone. For other opinions of this book, I suggest checking out these reviews from Ginger at GReads! and Tara at Fiction Folio. Not being able to identify the speaker is very annoying. Thanks for the honest review!